If you write a story about people or most aliens, then they will need to be wearing something to cover all the naughty bits. But what does their choice of body coverings and accessories say about them? Or you as a writer? Clothing and accessories can be used in many ways to add subtle details to a novel. How expensive it is can be an indicator of class or power, or if a thief, how successful work has been for them. In one Conan story, RE Howard’s character is mightily annoyed when a new cloak is ruined, just when he was enjoying a meal with some ill-gotten gains. Howard uses clothing quite often as a class, country or status indicator. Trulls, or working girls, are usually clad in fine silks, or cheap cotton, with the tinkle of silver bells, or copper coins denoting their relative purchase price. A woman wearing leather and covered up was a signal that here was no common trull, and indeed, Karela is an accomplished thief, and not one to take nonsense from a barbarian youth. It is inaccurate to view the past as one lacking in the appreciation of beauty. People laboured many hours to make decorative beads, dye leather, and make necklaces to showcase skills and status, or perhaps a soft texture is as appealing then as it is now. But while today it is easy to discard a damaged garment, in the past, repairs would have been made, perhaps many times. Damask tablecloths can be a fine patchwork of darns, their stitches so fine and careful that the repairs can scarcely be seen. What does that say about the person, or the time? Laura Ingalls tells of long days spent stitching sheets together- when worn in the centre, they would be ripped in half, and the edges sewn together by hand. Depression women made handkerchiefs out of the unworn bottoms of the husbands work shirts, or crafted dresses from flour bags. Unraveled cheap woolens to re knit anew. There are stories to be crafted from these carefully cherished materials. So fantasy and historical fiction can use a wealth of detail from history to identify guilds, status, occupation and sophistication with a degree of subtlety. However, please for the love of Crom, don’t put women in chain mail bikinis. Would you wear one to battle? Or a chain mail mankini? I seriously doubt it. Sci-fi often succumbs to a sartorial future of overalls. “Friday” by Heinlein had an all-purpose overall as an outfit worn by all levels of society. It’s an easy way to avoid thinking up future fashions, since these change so rapidly your description may just sound ludicrous in ten years time. Silver bikinis in Star Trek comes to mind! The other extreme of sci-fi fashion is exotic body modifications or a weird variant of some drug soaked sixties fashion. The Hunger Games movies typifies this style. But sci-fi can still have levels of society, of power and occupation. Andre Norton makes a point for her young space trader to yearn for the scuffed boots and long loping walk of the experienced spacers. Clothing modifications including tech is one field sci-fi could readily explore. Computer links are dealt with in E.M. Swift-Hook’s fascinating space opera series Fortunes Fools. Internet connections are part of everyone’s outfit, and sharing links or checking data becomes an integral part of the everyday life. Religion is an area where clothing can get pretty strange, varying from the elaborate catholic tiers of outfits and accessories, to the deliberately plain attire of Amish or Quaker. The robes of a nun or monk offer a ready form of identification, and possibly protection from molestation or robbery if traveling or in times of war. Or they may become a target, creating the possibility of a moral dilemma for the wearer. The Nun’s Story by Kathryn Hulme details some interesting insights into nun’s clothing, as well as being a cracking read. Check out the people around you in a crowd. Can you pick which ones care about clothes, and who does not? Does it correlate to what you can guess about their financial status? Or is a disguise for body parts they dislike? Agatha Christie uses a cheap ugly necklace to hide the scar that would mark the identity of a murderer. It was ‘something she always wore’ because she was never who they thought she was. It took a stranger to pick the incongruity of the necklace and personal style. So clothing may be a feature, a clue, or ignored by the novelist. However it is one of the fastest ways to pinpoint a character in the mind of a reader – focusing on an important point without belabouring the reader about the head with too much telling. Can you hear the rustle of taffeta as she descends the stairs? The reader surely can. 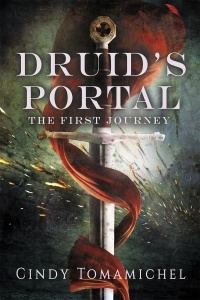 For those that have not read Druid’s Portal yet, here is a link to the first chapter DruidsPortal With the second due out in May, there is no better time to read the first! Thanks for reading. An amusing yet inoffensive euphemism was my intent. 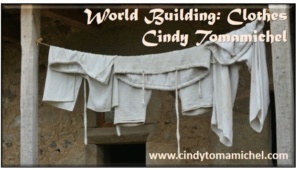 Cindy, I always enjoy your World building posts. So well thought out. Thank you Catherine, I appreciate that you took the time to read.